Nanopack infusions; Contains 1x 6 different flavoured infusions with a Blend of Botanicals, that will make it easy to create delicious Gin & Tonic cocktails. Té Tonic is the innovator of the Gin Infusions. Té Tonic has multiple certifications to guarentee quality! Lots of companies are copying now, but look out, many of those companies do not have all the health certificates, certified ingredients and certified materials. Many companies do not follow the EU law for Food production. BEAUTIFULLY PACKAGED FOR GIFTING. This is the perfect Gin gift set for any occasion! For both Man and Women, Birthdays, Anniversaries, Christenings and to say “Thank you!, Congratulations, Get well soon!… or ” I’m sorry”. Go on Surprise someone, they’ll love your original Gin Gift! 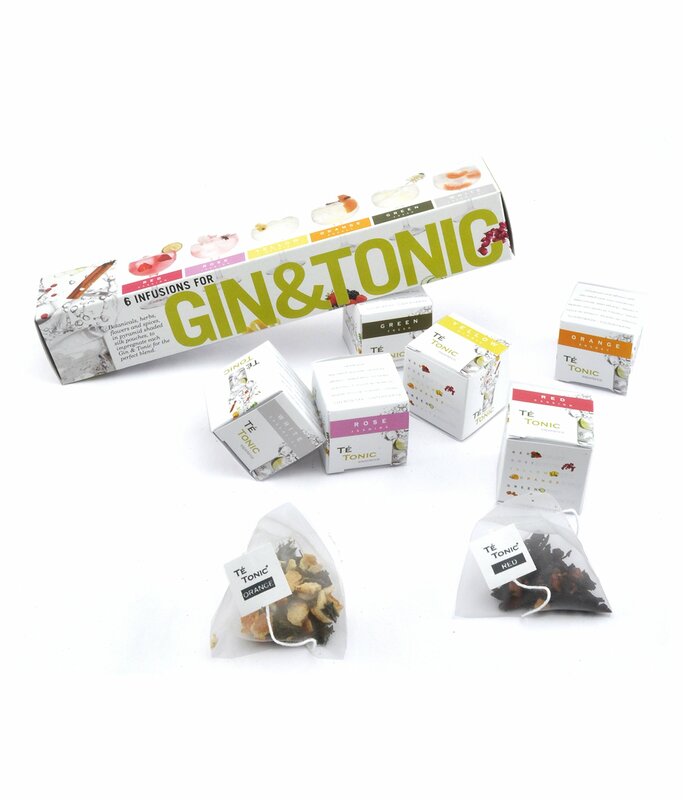 Té Tonic NanoPack includes: 6 different flavoured infusions to spice up your Gin & Tonic cocktail: 1 unit. Red Passion flavor (Dried apple, hibiscus, elderberry, rose-hip, strawberry, raspberry, blackberry and blackcurrant) 1 unit. Green flavor (Dried Cucumber, lemon rind, physalis, juniper berries, lemon verbena and cardamom) 1 unit. Rose Jasmine flavor (Hibiscus, to give the gin a light tint, dehydrated rose petals, orange blossom, green jasmine tea and dried apple) 1 unit. Yellow Citric flavor (lemon rind, hibiscus, juniper berries, camomile, physalis, lemon aroma and cardamom) 1 unit. Orange Energy flavor (Dried orange rind, dried lemon rind, whole cinnamon pods, mint, physalis, juniper berries and orange and cinnamon tea.) 1 unit. White Essential flavor (Physalis, lemon rind, juniper berries, black pepper, cardamom and orange blossom) AMAZING PACKAGING, IDEAL AS A GIN GIFT. Made in Spain. SHIPPED AND FULFILLED BY AMAZON; We use Amazon’s FBA service. Which means Amazon pick & pack’s your order and ships it to you. If you have Prime it is faster and free!